I had to put the Sand Cardigan in time-out. Sadly, there is not enough yarn to finish it. leaves both sleeves at shoulder level where they were placed on stitch holders! neither will do the job. Now I have to think if I want to knit this again with a different yarn or toss the whole pile. 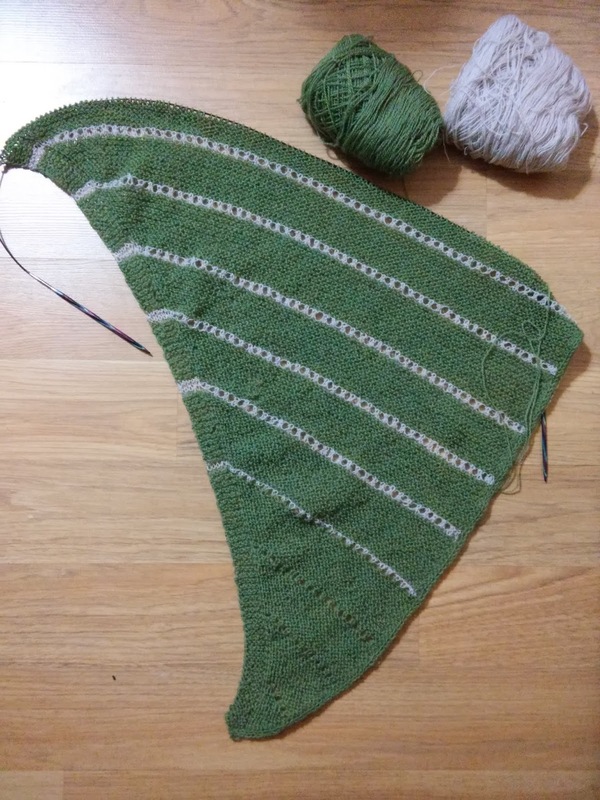 So I am knitting on the Swedish Lines shawl. A relaxing , entertaining knit with enough yarn to finish the job. Yarn chicken is no fun. The shawl looks fun though. Hope you're feeling better. Dang - I hope you find a solution for the Sand Cardigan. The shawl is looking fabulous. Well, the Sand Cardigan situation sounds a bit frustrating, but glad you could pivot into the great shawl. That's frustrating. As least you have another project to keep your hands busy while you contemplate! Ah shoot! Sorry the cardi will not be in the lovely yarn. Hope you find an alternative and start again. Well, darn it. That would have been a lovely shawl if bigger.